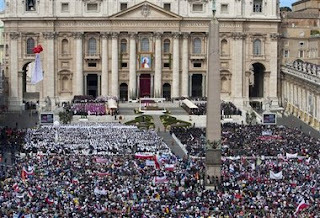 Catholics, 1.5 million strong mass to celebrate the beatification of Pope John Paul II. 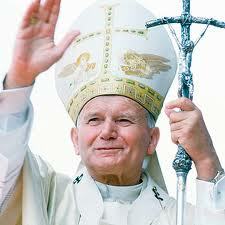 JPII a step closer to sainthood, a true holy man. A Pope that I grew up with. He was elected as I was a senior in high school. Catholics and non-Catholics alike realize what a honorable, faithful man is was. VATICAN CITY – Some 1.5 million pilgrims flooded Rome Sunday to watch Pope John Paul II move a step closer to sainthood in one of the largest Vatican Masses in history, an outpouring of adoration for a beloved and historic figure after years marred by church scandal. The turnout for the beatification far exceeded even the most optimistic expectation of 1 million people, the number Rome city officials predicted. For Catholics filling St. Peter's Square and its surrounding streets, and for those watching around the world the beatification was a welcome hearkening back to the days when the pope was almost universally beloved.